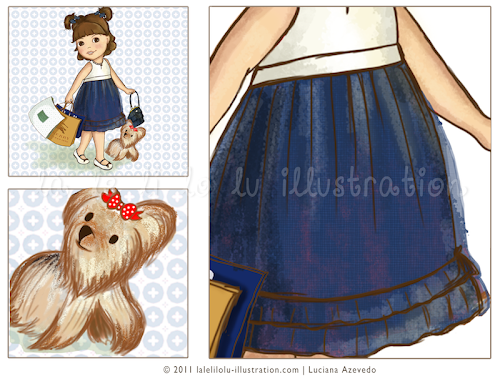 Add a very chic dress,a cute little dog and some fashion shopping to a beautiful and charming little girl and voilà: you have the illustration of Glamourous Girl! 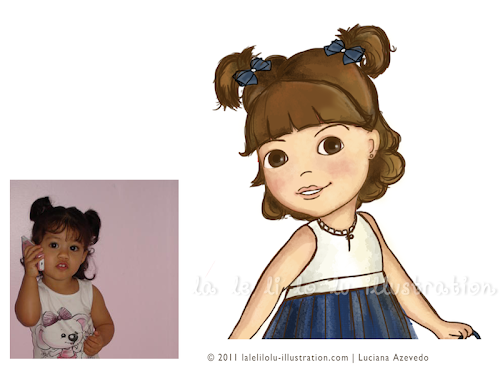 The little girl was inspired by Duda, Ciça’s daughter. Ciça is the owner of this Bazaar online, who made me laugh a lot with her funny emails and great sense of humour. This is the link to her Bazaar. Lu,vc é uma artista e tanto!Ficou igualzinha,adorei!!Lindaaa!! Beijos em vc e no Nic! !Otima semana!! Beautiful illustration! I like it! Thank you very much, Angels! Que trabalho mais lindo esse Lu. Voce realmente e uma artista incrivel. Muito obrigada Regina! Vc é muito amável!